In celebration of our country's 115th commemoration of our Independence, we're letting everyone try a few bottles of an All-Filipino Natural Soap. This June 12, 2013, starting at 12 midnight, all you have to do is to go and visit the Casa de Lorenzo Promo Page, leave your name, email and contact number on the form that will be available on Philippine Independence Day. The first 20 to sign up will be contacted and confirmed to get (1) 250mL Bottle of Calamansi Manila Castile Soap, our newest variant. 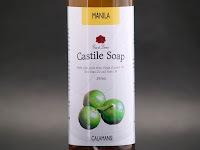 Only Natural Ingredients indigent to the Philippines make it to a bottle of Manila Castile Soap. Combining the Cleaning power of Virgin Coconut Oil Soap, the Moisturizing properties of Rice Bran Oil Soap, and the Lather of Palm Oil Soap, the Manila Castile Soap Variant is a great addition to Casa de Lorenzo. Scented with locally-sourced Essential Oils from plants and flowers of the Philippines, every bottle is delightful to the senses when bathing.